Los Angeles is where I call home (for the majority of the time that is). So it’s funny for me to think that I’ve never really explored the downtown area. Now that I have a friend that lives in the area, I’ve been spending a significant amount of time falling in love with the city. Here’s a list of four weird and/or unique things to see in downtown Los Angeles. The best part, it’s all within a two block radius so you don’t have to worry about parking. 😉 Enjoy! Downtown Los Angeles Map, center point Main and 5th – Click to enlarge. Imagine yourself entering a French dip restaurant. Walking past the host to the back wall only to find an unmarked door which leads to one of downtown LAs oldest speakeasys. If this sounds like fun to you then make your way to The Varnish, located in the back of Cole’s restaurant. It is a small dark intimate space which offers amazing cocktails and an exclusive vibe. They don’t allow overcrowding so you have to wait outside of the speakeasy for a table. Grab a seat at the bar at Cole’s while you wait. Where else can you grab a French dip sandwich one minute and then sip a Moscow mule in a speakeasy without ever stepping outside? Have you ever heard of an ice-creamery where you can pedal for a free scoop? 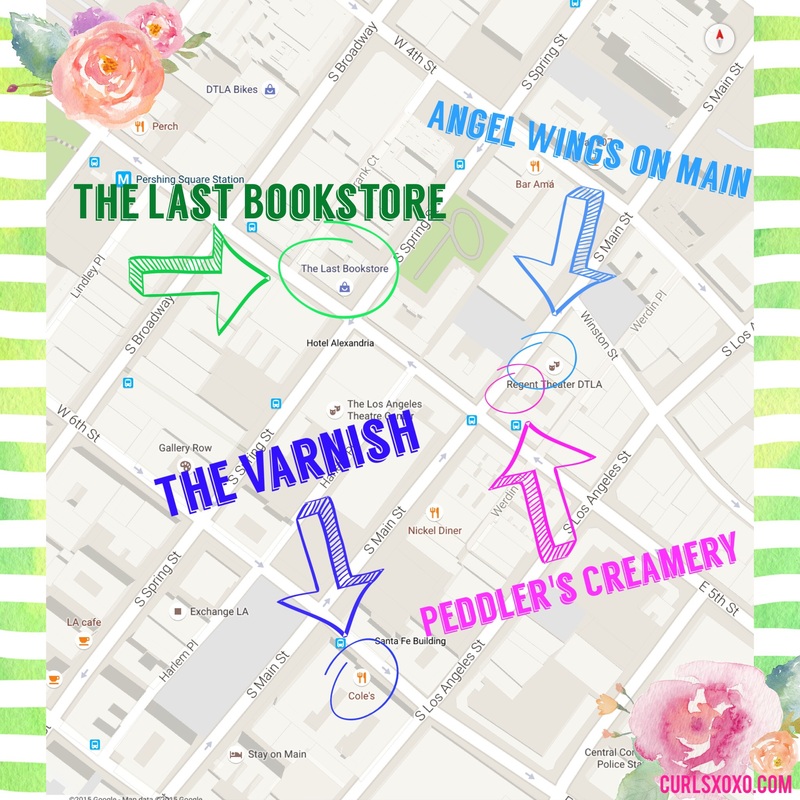 Well I hadn’t heard of it until I stumbled upon Peddler’s Creamery. Now the thought of having to exercise for 20 minutes before I can get some ice cream isn’t the most appealing thing to me, but some people go for that kind of stuff! So check this place out, even if it’s just to be a lookey loo to watch others bike for their scoop. Located right next to Peddler’s Creamery is the Regent Theater. What makes this place unique are the art installation pieces by Colette Miller. A pair of angel wings located on the sliding gates. Make sure to get there before the place opens, or else you’ll miss your chance for a photo-op. Now, The Last Bookstore may not really be the last bookstore but it is considered one of California’s largest. The store carries new and used books as well as records and art installations. You’ll find surprises around every corner… literally!